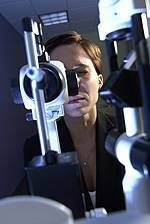 Like routine maintenance on your car and home, scheduling regular visits with our Carson City optometrist for a comprehensive eye exam—to test your current vision as well as screen for vision problems that might not be readily apparent—helps keep your most valued assets in peak condition. Regular eye exams at are important to maintaining good eye health by keeping your prescription up-to-date and also by detecting and preventing potential diseases before they can become problematic. Because many eye diseases and conditions can develop slowly and do not have any obvious symptoms, early detection can reduce the risk of further harm and give you the best treatment options.